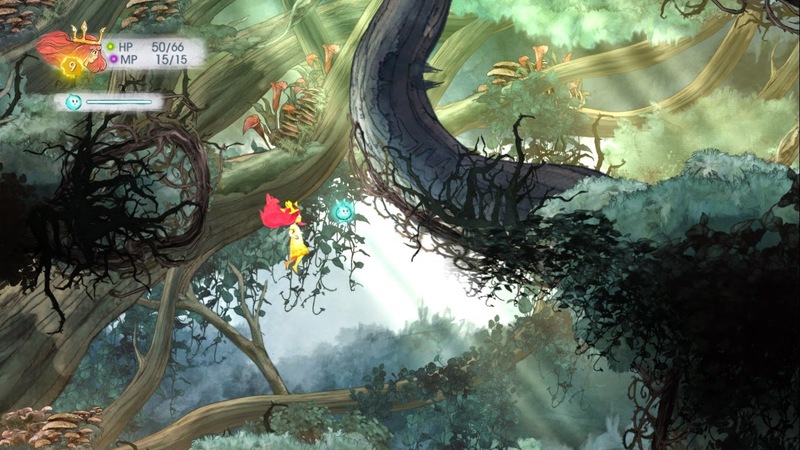 Child of light is the newest game from Ubisoft/Ubisoft Montreal and is absolutely gorgeous to look at, utilising the UbiArt framework engine (also used in the recent Rayman games) to immerse the 3D character of Aurora into a beautiful world of watercolour masterpieces. Aurora, the daughter of an Austrian Duke passes away one night and wakes up in the strange land of Lemuria which she must save to return home. She is joined by a firefly which can either be controlled by yourself or piloted by another player who helps to collect wishes, open secret chests, daze bad guys so you can sneak up on them, slow their casting time in battle and even heal your fighters, plenty of stuff to keep one or two players on their toes. They're are lots of chests to find throughout the world for Aurora and ones just for the firefly, all with randomised loot, there are little puzzles hidden throughout too, some of which you need your fireflies help for and some that just need a little imagination or forethought, there are loads of little areas you can look in to find extra chests, big monster battles and even new characters to join your team and fight alongside you in battle! 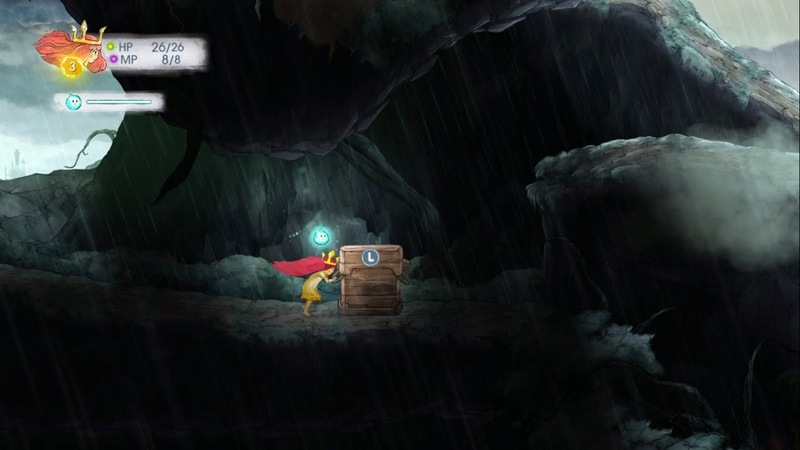 During the course of the story Aurora also gains the ability to fly through the world unlocking loads more areas to explore, treasures to find and plenty of level replay value as you go back to explore the areas above and below you may have missed. Then we have the battle system, which for me is my favorite aspect of the game. It's very similar to that of other J-RPG's (such as Final Fantasy for example) in that it uses the active time battle system but with a twist. When waiting to act/take a potion etc and then when casting, your characters move across a bar on which you can also see your opponents, when you reach the front of the casting area you choose your action, it may be very fast, medium or very long for example and your characters mark moves across the bar at that particular speed, you have to be careful with your timing though as if an opponent hits you while you're in this casting zone you'll get knocked back out of it and have to wait even longer to act. 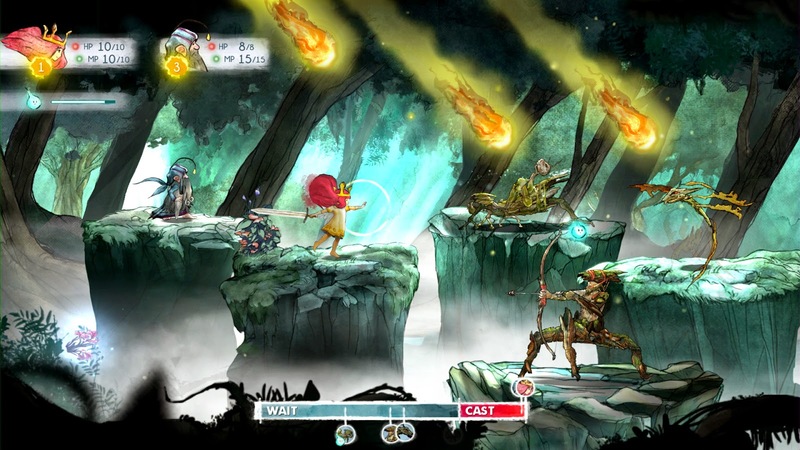 Both your characters and your opponents can cast buffs to move across the bar faster so it can require strategic thinking, weighing up your options can be important, if you're not sure you can outcast your opponent is it best to go into defense for reduced damage, no interrupt and a speed boost for your next move. Your firefly can help too, glowing intensely over your opponents and blinding them to help slow the speed with which they move across the bar as well as being able to heal your characters and pick up wishes around the area to regain HP and MP which can come in very useful! He can even help just before a battle as if you approach the creature from behind you can initiate a surprise attack meaning your characters start at the beginning of the casting area of the bar which can be a great advantage in battle, if the creature isn't facing away from you, you can have your firefly hover over them and daze them so you can sneak around them. As mentioned before, lots to do to keep a second player busy with if need be. Some mobs will also have certain weaknesses and resistances as well, for example the ghost like spirits are vulnerable to light magic, Gargoyles are weak to fire magic and the firey hyena looking creatures are weak to water magic so it tends to help to train your characters in a balanced way to prepare for a load of different creatures. Helpfully you can switch characters during a battle so if you no longer have need for the super fast healing jester Rubella and more in need of the elemental magic wielding Finn you can do so mid-battle if need be. To help along with these battles you also gain skill levels as you progress and gain experience from battles, for each level your characters level up they receive a skill point to spend in their "skill tree" which allows them to learn new and more powerful spells. They seem to usually have three "branches" each and I guess you can focus on one to start with and then go for the others or mix it up a bit, depending on what appeals to you. 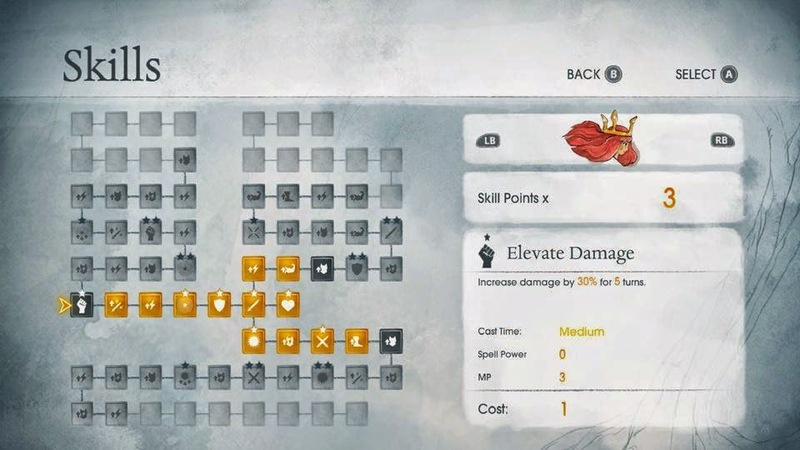 Although it may seem overwhelming to get a skill point EVERY level which can sometimes be after just three or four battles, never fear you won't be forced to choose loads of abilities you'll never use, instead, scattered throughout the majority of the skill tree are improvements to things such as total health points, magic defense and magic points etc as well as new abilities and improvements to known abilities as well. 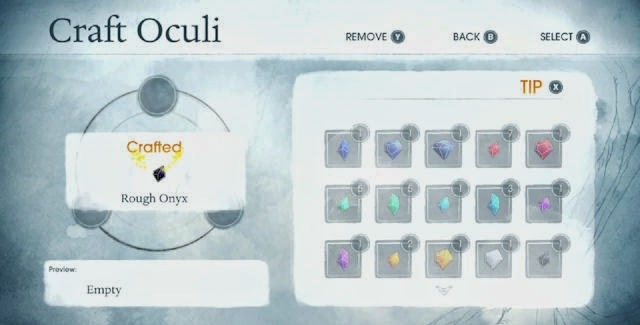 In addition to the skill tree there is also the Oculi system which acts very much like the gem system in warcraft, the runes and sigils in Guild Wars 2 and materia in FFVII in that you collect Oculi, usually from chests or battles and these can then be added to your items to give certain boots and abilities. In addition to this you can increase their power and even change them completely using the Oculi crafting system, for example crafting together three rough emeralds will create a more powerful tumbled emerald, or combining a sapphire and a ruby to create an amethyst and even, a ruby, sapphire and emerald to create a diamond of the type combined! There are loads of possibilities to create different new Oculi from the ones you collect around the world, which can all help to result in the one of the most powerful and difficult to make Oculi, the Princess Stone (brillant spinel, diamond and onyx are needed!). I like that they've used a very familar system and just tweaked it a bit to make it more interesting and give a goal to work towards while also furthering possible customisation for your characters. 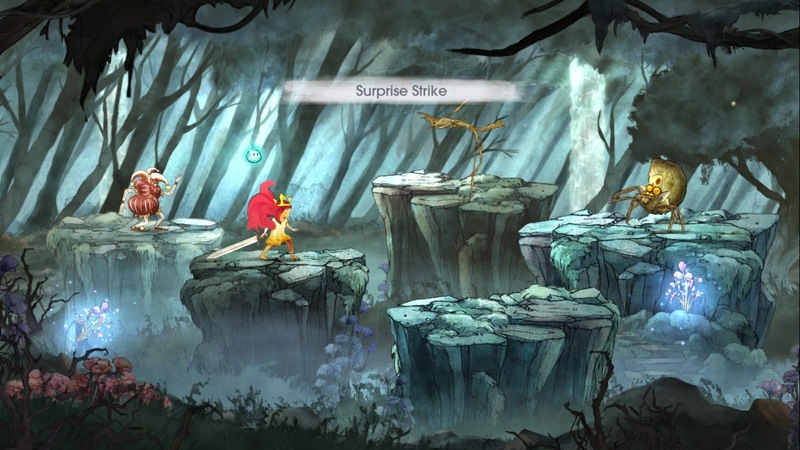 I want to give a brief mention and congratulations to the team who worked on the music and sound effects for Child of Light as the music fits with extremely well with the beautiful backgrounds and dreamlike quality the game portrays (check out the video below for the theme). 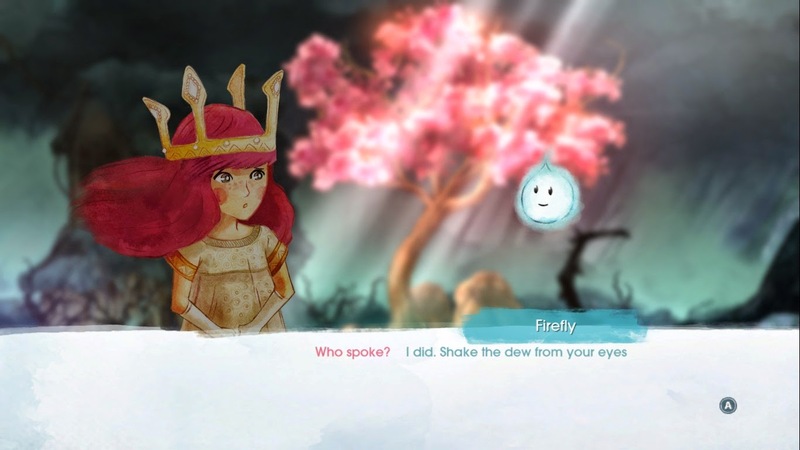 In addition to the beautiful music someone deserves a good pat on the back for the perfect use of sound effects, for me one of my favorite noises in the game is the gentle noise of Aurora's wings as she flies about. This and many other little sounds really give the game a fantastic presence. I've left my review of the story itself for last as sadly for me personally it was the weakest part of a fantastic game. There is a story and even side quests to move you around the world of Lemuria but other than the beautiful stain glass windows used every so often most of the dialogue is portrayed through illustrated characters talking to each other, in tune with the J-RPG style it seems to embody these conversations are text based and this is absolutely fine, the one gripe I have with it is that pretty much every sentence rhymes...This was cute and a little funny at first but after ten plus hours of game play it really REALLY began to grate, especially as so many of the rhymes felt extremely forced and a bit random. This can make it hard to concentrate on whats going on the story when you're having to decipher half of the things the characters are saying. Although I do like a good story with my games I find the other aspects of this game so enjoyable that I can look past what was probably meant as a cute little quirk to add to the semi fairytale vibe. Overall I highly recommend this game, especially to anyone who does like the J-RPG genre and those who enjoy visually interesting games. At currently £11.99 on Steam I feel it's a complete bargain seeing as I've already gotten nineteen hours of play out of it and will probably play through it again as treasure etc is randomised and I'd like to experiment with my skill tree to create a different kind of fighting team to beat the game with. I will say though that anyone playing the game who already has experience with this kind of game may benefit from playing on the harder difficulty at least as even the normal mode is quite easy and although the first few wins are satisfying they begin to seem more like a hindrance than the enjoyable part of the game it is meant to be when you really have to think carefully about your timing and each of your moves. 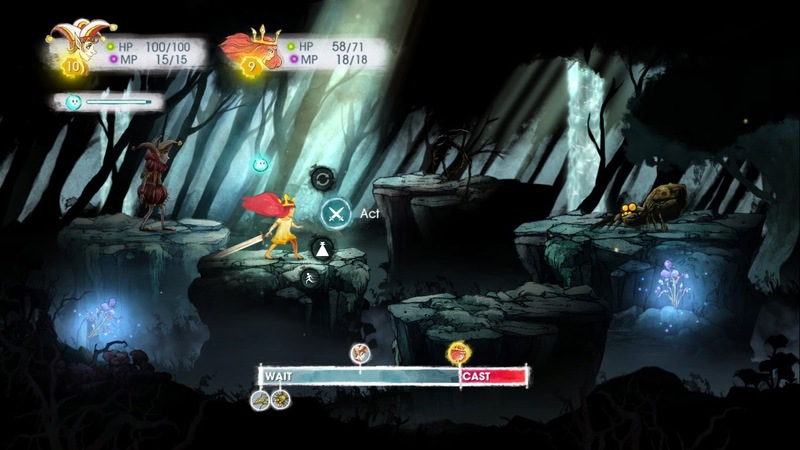 As mentioned before Child of Light is currently out on Steam (with full controller support), in addition to being available on Xbox 360, Xbox One, PS4, PS3 and the WiiU.